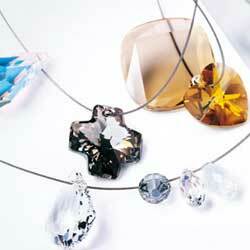 Swarovski's Crystal Pendants offer timeless elegance. Available in a large range of shapes, colours, and cuts and offers a multitude of applications including jewelry manipulation, textile, and interior applications. Pendants with large surfaces also offers additonal option of applying customoized motifs.